Geocaching is a great way to combine a bit of fun technological geekery with some good old fashioned go-outside-and-get-some-fresh-air action. 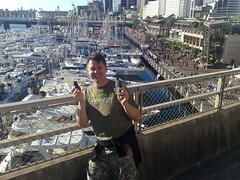 I spent an afternoon with another blogger using our GPSs, iPhones, Flip Videos and other techy toys and went geocaching around Sydney. If you’ve never tried it before, geocaching is essentially a treasure hunt where you go looking for a hidden treasure (more correctly known as a geocache) which someone plants and publishes on www.geocaching.com. It’s a simple enough concept… once you sign up on the site, you enter your current position and it will tell you what caches are hidden nearby. You then just pick one that sounds interesting, enter the cache coordinates into your GPS and navigate to the hidden treasure. It sounds simple enough, but once you start to allow for the real-world factor it does start to get a shade more complicated. GPS devices will tell you where you are but they have limits as to how accurately they are able to do so. Under perfect conditions – clear sky, no obstructions from trees or buildings, no atmospheric interference, etc – a GPS ought to be able to pinpoint your location to within about 2 metres. I reality, the tracking is often far more vague and the accuracy level only gets you within 5-15 metres of the target. Both caches we found today were quite small and well hidden… as you might imagine, trying to find a small object within a 15 metre radius can be a little difficult, especially when you have no real idea what you’re actually looking for! The first cache was at North Sydney, called Woof’s Water. It was easy enough to get to the general location, but much harder to locate the cache itself. The small park to which we were directed had several garden beds and landscaped shrubbery surrounding it but because it was nestled between the Sydney Harbour Bridge rail line and some tall buildings across the road, the view of the sky was a little narrow. This makes it hard for the satellites to triangulate accurately and usually gives somewhat dodgy results. This is where geocaching gets interesting. The GPS can get you close, but once you find the general spot you often need to start thinking laterally, asking yourself where might be a logical place to hide a cache around here… (“if it were me, where would I hide a cache?”) We agreed that the garden bed along the railway line would be a good place to start, and we spent a good 15 minutes peering our way through the long grassy plants. I was just about to give up when I heard the call of “found it!” Sure enough, it was pulled from the long grass and the log book filled in. To make life easier before we chose our next cache, we dropped into the Sydney Apple Store to look at geocaching.com on one of their 24 inch iMacs. While we were there, we also logged the first cache on the website and worked out our next target. For cache number two, we decided on one called Imax, named presumably because it would lead us to the Imax cinema at Darling Harbour. As we strolled down King Street and along the pedestrian walkway, it did indeed lead towards the Imax, but also to huge throngs of people in Darling Harbour. Geocaching is a pretty simple concept really… after you punch in the cache coordinates, your GPS will draw a line between you and the cache. Just keep walking towards the target until the line disappears and you should, theoretically anyway, be standing right on top of the cache. As we approached the spot where the line was about the vanish, the GPS started doing some very odd things. The target coords started jumping all over the place and the GPS was going haywire. I looked up to see the Western Distributor overpass going directly overhead and started cursing whoever was silly enough to plant a GPS cache somewhere that did not have a clear view of the sky. Fancy hiding a cache in a spot which did not get a direct line of sight to the satellites! The freeway was right in the way…. the freeway was, oh wait, I get it! This was a classic example of a cache not being where you first expected to find it, and having that “aha!” moment when you realise how clever the cache owner has actually been. We used the iPhone to browse the geocaching.com website when we needed to look for clues or read the comments of other geocachers. We used Qik on my Nokia N95 to live stream video to my blogsite of our searching. We took footage on our Flip video cameras. We used Twinkle on the iPhone to tweet the results of our searching out to our PLN community, along with photos. It was a good day for gadgets and to play around with their ability to keep the blogosphere in the loop while we did it. If you’ve never tried geocaching before, I recommend you give it a go. It’s a great outdoor activity, allowing you to get out in the fresh air while also satisfying your inner geek. It often causes you to think, gives you some exercise, makes you laugh a bit, and teaches you things about yourself, your city and your world, all at the same time. PS: I’ve since discovered a very cool app for my Nokia N95 called Geocache Navigator. It enables you to enter geocache coordinates in your Nokia phone and a mapping app appears, directing you to your cache target. Because it uses the N95’s built in GPS and also integrates directly with geocaching.com, it can tell you where the nearest cache point is, and let you update your status once you find it. Nice work! That class geocaching project could perhaps be closer than you think! You are the Search Engine by Chris Betcher is licensed under a Creative Commons Attribution-ShareAlike 4.0 International License. Previous PostPrevious The New Digital Divide?